The current Chief of Carmichael is Richard Carmichael of Carmichael, 30th Chief of the Name and Arms and 26th Baron of the lands of Carmichael in Lanarkshire, Scotland. There is only one source of the name Carmichael and that is territorial or geographic in origin from the northern edge of the Southern Uplands in Scotland. An ancient hill fort or caer in a prominent location close to the main route north from the border was chosen by the good Queen Margaret in the year 1058 as the site of one of her first six churches established in the see of Glasgow. Due to the prominence of the site, she dedicated the church to St. Michel and the district and its peoples became of Caermichel when surnames were necessitated in the thirteenth century. During the fourteenth, fifteenth and sixteenth centuries, Carmichaels travelled widely – some to Galloway – where they became kinsmen of the Stewarts of Galloway and later moved northwards settling in Lismore and Appin as kinsmen of the Stewarts of Appin and the McDougals. Others went to Holland where Robert Carmichael the armourer still has descendants known today as Carmiggelts. Further movements to Ireland in 1690 and to the Americas from 1650 onwards resulted in the world-wide spread of the name. Events such as the emancipation of slavery when released slaves in Carolina took the name of their Scottish plantation owner employer gave a mixed race element whilst the highland clearances moved many Scottish Carmichaels abroad. After Culloden many ‘macghilliemichels’ (gaelic for sons of the servant of St Michael) changed their name to Carmichael. The 1997 world-wide Carmichael population is estimated at over 42,000 with half resident in the United States, a quarter in the United Kingdom and 10% in Canada. A further 10% lives in Australasia. Ireland, Germany, Switzerland, France, Holland, South Africa and Italy each have significant Carmichael population. 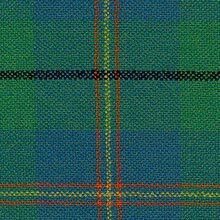 The Carmichael tartan was first recorded by Carmichael of Archerfield in the Highland Collection 1905 and was confirmed by the 30th Chief Richard in 1981. It is registered in the tartan register kept by the Lord Lyon in New Register House Edinburgh. Below is an example of the ancient Carmichael Tartan. Carmichael Tartan good are available through our online shop and the Visitor Centre and Farm Shop at Carmichael. The first gathering was in 1983 at Carmichael based on the Tinto hotel, the tour went to Lismore, Stirling and Loch Ness. The gatherings in 1986 and 1990 were based at the Peebles Hydro. Those in 1993, 1996, 2000 and 2004 were based at Carmichael itself using cottages and local hotels. The 11th International Clan Gathering was be held at Carmichael in August of 2017. The 1986 tour went to Oban, Lismore, Loch Ness, Inverness, Huntly castle and Braemar and Glenshee. The 1990 tour was based at Coylumbridge and went to Armadale, Drumnadrochit, Fyvie, Balmoral and Cairngorm mountain summit. The 1993 tour went to John o’ Groats, Orkney, Cape Wrath, Ullapool , the Western Isles and Lismore. In 1996 the tour went to Fort William, Tobermory on Mull, Duart castle, Iona, Mull of Kintyre and Arran. In 2000 we visited St Michaels Mount in Cornwall, Mt St Michel in Normandy, Bauge battlefield and Orleans city in France . In 2004 we started in Skye with the Clan McLeod, visited Aviemore and Clan Macpherson, toured castles in Aberdeenshire, Dundee Jute and the Ship Discovery and ended up on top of the Wallace monument. The Chief’s Highland Tour in 2017 took place after the gathering. The gathering day tours have covered Edinburgh city and castle, the Playhouse theatre, Glasgow Burrel collection, Bannockburn, Ayrshire and Burns country, Dumfries, St Andrews and the Kingdom of Fife, the borders including Jedburgh, Kelso, Sir Walter Scott’s house, Drumlanrig and Mellerstein plus Roslin chapel and Fenton Tower and Linlithgow Palace. The 2007 tour spent the first night at Inverary and then sailed to Port Chalotte on the island of Islay, visiting Finlaggan. The third night was on the island of Colonsay and we visited oronsay priory at low tide. The fifth night was spent on Mull with a glorious day trip to Staffa and Fingal’s cave. The final night was at Port Appin in the Pierhouse hotel with a return journey to Carmichael via the new Glencoe visitor centre. In 2010 we flew with Flybe with a party of 14 from Edinburgh to Sumburgh in the Shetland Isles and stayed at the Sumburgh hotel near Jarlshoff and visited there and the Sumburgh Head cliffs next day. On the Tuesday we sailed to Mousa for the best preserved Broch in the world and then stayed in Lerwick before sailing to Noss with Seabirds and Seals charter from Dr Jonathan Wills. The Shetland museum and Jewelery factory plus Esheness lighthouse and cliffs were all visited and a spectacular last night spent at Busta House hotel with guitar playing by Hamish Carmichael. Scalloway castle was visited on the way back south on the Friday and St Ninians Isle. A truly great trip! There is still plenty more material for future gatherings and tours despite our continued cross- crossing of the country for over two decades. The tours demonstrate the rich historic tapestry that is Scotland. The heartland and nation state home of Clan Carmichael Tout Jour Prest.